The Return of the Crone? “They say you walk about in that caravan naked.” So says smiling Willie from the palatial static in the row along from mine, the one known as ‘Millionaire’s Row’. I am incredulous. 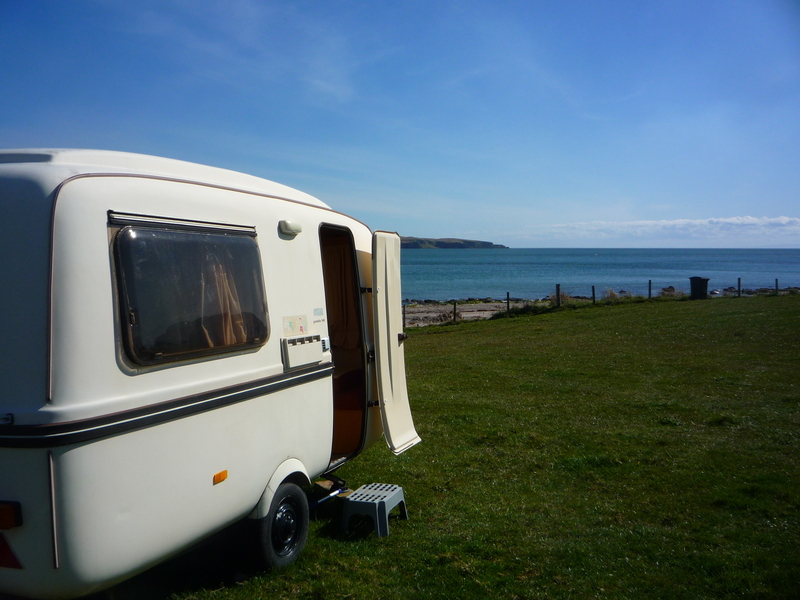 Some facts: my 1970s towing caravan, newly pitched on the site in Argyll this summer, is 12ft long from its back lights to its hitch and is one of the smallest it is possible to have. The floor area is five foot by three – not enough to swing anything and you can almost put the kettle on from the bunk. We both laughed at this ridiculous notion – he slightly less heartily. Willie, quickly distancing himself from the very idea he had voiced, adeptly body swerved any further questions. The conversation quickly shifted to more acceptable investigations as we each searched for commonalities in that new-neighbour way that people do. A similar rumour circulated around the Ayrshire seaside village where I once lived. It was said that a woman who lived alone in a shore-side cottage, who kept herself to herself, went about the house naked. Local children used to walk past hoping for a glimpse of her nakedness. Was I now a woman about whom people dreamt up daft, frankly medieval notions by which to explain her chosen solitude? There is a common factor in these batty rumours: woman (probably older) alone in a dwelling by the sea prances about in the buff. People, knowing little about either woman, may or may not choose to believe this ridiculous idea, however there is still talk. Who starts such a rumour and why? Do I detect the fear of the crone: suspicion of unfettered female sexuality (i.e. no bloke in sight), the faintest whiff of superstition, witches… An closer examination of on-site gender relations may prove fruitful. The summertime area for touring caravans, including mine, does not as yet have a name. I suggest The Squat to the site owner – he agrees to put it out for consultation. It is in the field which runs down to the seashore. My pitch is nearest to the beach with stunning sea views. A rough wooden fence was built to separate my ‘van from the next man’s . Another rumour had it that my neighbour Chic was not very happy about my prime location. He had insisted that the fence wasn’t long enough to keep my caravan out of his line of sight (had he heard the rumour about my private prancing?). Another clype couldn’t stop himself from telling me that after he saw Chic drinking coffee with me, after he had cut my grass and helped me with my generator. Said Clype had introduced himself and said rather too knowingly “Ah… so you’re Glesca Anni…?”. To set the record straight: when I introduced myself, Chic had fallen over himself with offers of help and coffee saying how very glad he was that I had come over. He also stressed that his partner wasn’t well and he was hoping she would come with him on his next visit. He got to talking, told me practically his whole life story over one coffee and he only occasionally searched for commonalities in that new-neighbour way that people do. I mostly smiled and nodded. We are sound now though, his four year old grandson sweetly calls me ‘lady’. So there I was, looking forward to happy days spent alone at my new peaceful, settled bolthole by the sea, too small for guests, away from it all, no signal or wifi, where only Radio Ulster can be heard and what happens? Am I an old tale – a crone- the one about whom people can still create strange, faintly witchy fantasies? I am working on being accepted by this new community. I continue searching for commonalities in that new-neighbour way that people do. It may take some time but the views are worth it.